There’s “tone at the top” and then there’s Pope Francis. Word. Now that he has been in office just over a year, CEOs who are serious about ethical culture should take stock. This is the opposite of what we see from many CEOs who think “tone at the top” means “tone from my mouth” – which has landed that term on my banned list until further notice. And don’t hold your breath for that. Mary Barra, new and embattled GM CEO is a current and very public example of a CEO making some bold statements on transparency and accountability. She’s in a tough spot, called upon at the start of her tenure to manage the automaker’s alleged 10-year delay in recalling cars with a deadly ignition switch flaw. Time will tell whether Ms. Barra’s words will be followed by consistent, equally bold action. This week’s teachable moment from Pope Francis, for Ms. Barra and others, is that sometimes visible actions by leadership require no words at all. The Pope Francis Effect is fascinating for compliance professionals to watch. For instance, the tremors from his “no frills” lifestyle can be felt near and far in the Catholic world and beyond. Instead of the opulent 12-plus-room papal apartment on the top floor of the Apostolic Palace, Pope Francis lives in modest, two-room Vatican hotel room. He’s ditched the bulletproofed glassed enclosed “Popemobile” in favor of an open-air white jeep, and sometimes rides the bus. He has no entourage. So strong are the tremors from the Pope’s everyday life in Vatican City that they have caused a small earthquake 5,020 miles away, in Atlanta Georgia. That’s where Archbishop Gregory Wilton has just decided to sell the $2.2Mn mansion he built for himself only three months ago. The mansion features an elevator, two dining rooms and a “safe room” (a planned wine cellar was abandoned as pushback from angry parishioners grew). Not very humble, and rather bad timing by the archbishop. One can imagine that no words needed to be exchanged between Vatican City and Atlanta. 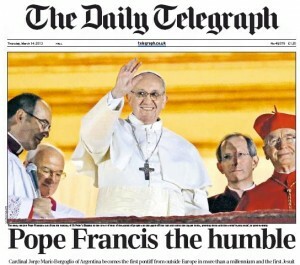 The archbishop clearly got the memo, with no memo needing to be written. What Pope Francis understands instinctively is the power of simply living the actions he would like his people to emulate. In other words, if you want your people to ride the bus, ride a bus. The Pope Francis Effect has been equally remarkable beyond just the Catholic leadership. With his simple words and humble actions, the Pope has led a radical shift in the church’s focus to mercy rather than moralizing, which some say has made being Catholic “cool again” This has gone a long way in restoring to the church credibility, trust and accountability – powerful assets for any organization. Another week, another “teachable moment” for CEOs from Pope Francis. Imagine a world full of CEOs who understood the lesson.